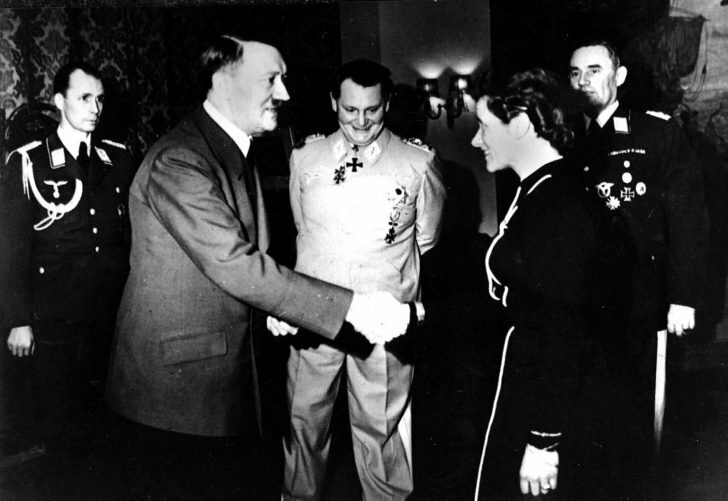 German female pilot, captain Hanna Reitsch, shakes hands with German Reich Chancellor Adolf Hitler after her awarding the Iron Cross of the second degree for outstanding service during the war. In the background in the center is Hermann Goering. Left: Nicolaus von Below, adjutant of Adolf Hitler. Hanna Reich (1912–1979) – German test pilot, served as an instructor pilot in the Luftwaffe during the war.